The 2017 Edition of the Philippine Startup Challenge (PSC 4) has reached its Semifinal Stage. Launched last August 1, 2017, at the Department of Information and Information Technology (DICT) head office, the PSC 4 is aimed at the Filipino youth to come up with innovative solutions to everyday problems of the Filipino. 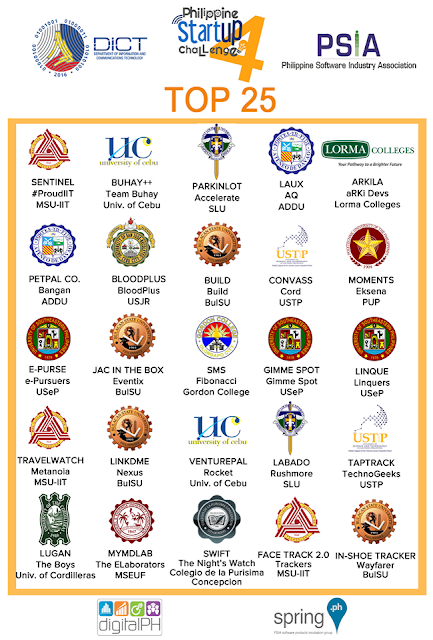 The 25 semifinalists came from a field of 202 initial participants. The DICT with the PSC 4 as its main vehicle seeks to harness the Filipino youth’s resourcefulness, innovativeness, creativity, and genius due to their natural inclination in the use Information and Communications Technology (ICT). The challenge started with a Mentorship Bootcamp that tackled on the technical and business aspects of startups. This year’s challenge focused on 25 local problems that need innovative solutions that will utilize ICT solutions ideated, designed and developed by competing teams composed of college students nationwide. The Philippine Startup Community assessed the concepts of the teams who in turn will undergo coaching for concept and idea development. 1. ARKILA (Team Arki Devs; Lorma Colleges) - Arkila is a ride-hailing and logistics services transport solution app that offers wide range of vehicle selection. 2. BLOODPLUS (Team BloodPlus; University of San Jose – Recoletos) - BloodPlus is a web and mobile application where people can request for blood if they are urgently in need for blood and notifies eligible blood donors. 4. BUILD (Team Build; Bulacan State University) - BUILD is a web and mobile application wherein buyers (clients) and suppliers (bidders) from different areas can connect through one centralized electronic procurement system. 5. CONVASS (Team Cord; University of Science and Technology of Southern Philippines) – Convass is a website for online canvassing and purchasing of construction materials for government agencies whose budget is Php50, 000 below. 6. E-PURSE (e-Pursuers; University of Southeastern Philippines) - e-Purse is mobile wallet application that digitally pays the items and also store changes up until the last cent. 7. FACE TRACK 2.0 (Team Trackers; Mindanao State University – Iligan Institute of Technology) - Face Track 2.0 was inspired by the slow inspection system in Iligan City that would take an hour for verification of each citizen and that disturbs the activities and appointments of each citizens and sometimes, unmonitored or lack of enforcement. 8. GIMME SPOT (Team Gimme Spot; University of Southeastern Philippines) - Gimme Spot is a toilet finder for both public and private toilet. it will also let you host your own private toilet to be rented. 9. IN-SHOE TRACKER (Team Wayfarer; Bulacan State University) – Wayfarer is a tracking device designed to track travelers by incorporating the device in the traveler’s shoes using piezoelectric transducer. 10. JAC IN THE BOX (Team Eventrix; Bulacan State University) – Jac in the box is an application intended to provide convenience in organizing celebrations and surprises based on the customer's time and budget, delivering all services directly to them. 11. LABADO (Team Rushmore; Saint Louis University) - Labado is a pickup, wash, and delivery service that provides transient students a convenient way to have their laundry done. 12. LAUX (Team AQ; Ateneo de Davao University) - Laux is a service app primarily handling laundry services that focuses on cleaning, washing, and dry cleaning clothes. 13. LINKMED (Team Nexus; Bulacan State University) - LinkMed aims to make the Philippines’ doctor services to become more flexible by reaching the distant patient and extending the hospital services by using technology. 14. LINQUE (Team Linquers; University of Southeastern Philippines) – Linque is for all sari-sari store owners and company's sales workers who are experienced hassle delivery, inefficient and improper distribution of goods. 15. LUGAN (Team The Boys; University of the Cordilleras) – Lugan is a shared ride service that picks up multiple passengers heading in the same direction and keeping rides affordable and easy. 16. MOMENTS (Team Eksena; Polytechnic University of the Philippines) – Moments is a web-based platform as a service to be used by event organizers in finding event resources provided by legit businessmen. 17. MYMDLAB (Team The Elaborators; Manuel S. Enverga University Foundation) - myMDLab is a mobile and digital application that lets the patient request for laboratory services at the comfort of his home. 18. PARKinLOT (Team Accelerate; Saint Louis University) - ParkInLot, is a mobile-web application that will help lessen road obstruction by utilizing unused parking. 19. PETPAL CO. (Team Bangan; Ateneo de Davao University) – Petpal Co. is an application that can help you find trusted pet sitters. 20. SENTINEL (Team #Proud IIT; Mindanao State University – Iligan Institute of Technology) – Sentinel is a Smart Watch with GPS locator with a feature that, when activated, will locate the person in any place. 21. S.M.S (Team Fibonacci; Gordon College) – S.M.S or Send me to school is a scholarship-matching application designed to ease the scholarship searching and application process. 22. SWIFT (Team The Night’s Watch; Colegio de la Purisima Concepcion) - Swift lets you hire bike and motorcycle riders to deliver your documents from point A to point B securely, easily, and swiftly. 23. TAP TRACK (Team TechnoGeeks; University of Science and Technology of Southern Philippines) – Tap Track is a Portable RFID Based Attendance Management System with SMS Transmission for Field Workers. 24. TRAVEL WATCH (Team Metanoia; Mindanao State University – Iligan Institute of Technology) – Travel watch is an IoT technology that helps the drivers to stay alert, secure and safe throughout the travel. 25. VENTURE PAL (Team Rocket; University of Cebu – Main) - Venture Pal is an online investment pooling platform for Philippine Micro, Small and Medium Enterprises. The government, private companies, and organizations collaborated in this endeavor together with the Philippine Startup Community. Partnering with them are Huawei Technologies, Microsoft, Ideaspace, and Launchgarage.